The Europe market for neurological disorder drugs features a largely consolidated vendor landscape, with the top five vendors, namely, GlaxoSmithKline plc, Astra Zeneca, Merck & Co., Novartis AG, and Bayer AG, accounting for a significant 60.5% of the overall market in 2015, observes Transparency Market Research in a recent report. Diverting funds towards research and development activities to strengthen product portfolios and geographical expansion are expected to be the key growth strategies of these leading vendors in the market in the near future. Transparency Market Research predicts that the Europe neurological disorder drugs market will exhibit a healthy 6.4% CAGR over the period between 2016 and 2024, rising from a valuation of US$18.3 bn in 2015 to US$32.0 bn by 2024. Of the variety of neurological disorders that the Europe neurological disorder drugs market caters to, the segment of cerebrovascular diseases contributed the dominant share of revenue to the overall market in 2015. The segment is also expected to exhibit a robust rate of growth over the next few years as the number of people with cerebrovascular conditions such as headache, migraine, and stroke rise. 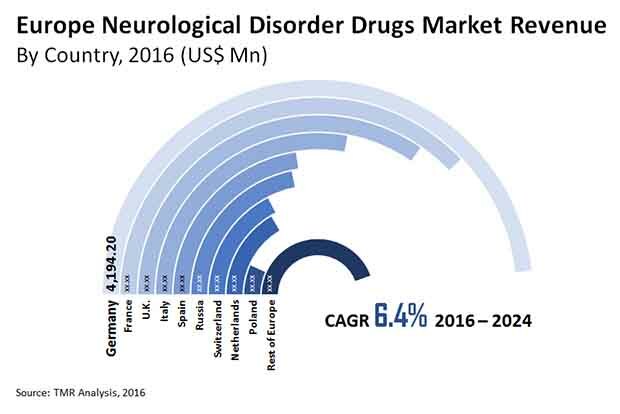 From a geographical perspective, the market for neurological disorder drugs in Germany accounted for a sizeable share in the overall market, surpassing the market in other key European markets such as the U.K., Russia, Italy, France, Switzerland, Poland, Spain, and Netherlands. The country is expected to retain the lead, expanding at a favorable 6.8% CAGR over the forecast period. Switzerland will also offer vast growth opportunities to the overall market throughout the forecast period owing to the rising awareness about neurological diseases. The significant rise in prevalence of neurological diseases in Europe has compelled several pharmaceutical companies to invest their efforts in research and development activities aimed at the development of effective drug candidates to treat these brain-altering conditions. Funds being poured towards this cause will be the key to the overall development of the Europe neurological diseases market in the near future. The demand for neurological disorder drugs will also be driven due to the rising geriatric population in the region, which is more vulnerable to neurological diseases. Initiatives taken by governments of several European countries to increase awareness about the need for proper management of neurological diseases and funds to support research and development efforts will also drive the market. Moreover, an increasing number of drug candidates appearing in clinical trials mark at a promising future in the field of neurological disease treatment in the region. The high expenditure required to undertake research and development activities in the field of neurological diseases has kept many potential small- and medium-scale companies out of the Europe neurological disorder drugs market. This has slowed down the rate of development of new and innovative drug candidates in the market, limiting the growth prospects of the market to a large extent.